This year marks 55 years since Bob Dylan released his first album, a low-key self-titled affair that consisted mostly of folk standards, with a couple of original songs sprinkled in, just enough to give the world a taste of what was to come. What came next was a slew of albums full of poetic songs, clever songs, some of the greatest songs ever written, songs that people will be discussing for hundreds of years. Many of his 38 studio albums feature that kind of magic; I’d say probably the majority of them. He hit a few stumbling blocks over the years, whether it was a rash of uninspired albums or brief detours into unfamiliar territory, but Bob usually bounces back from those weird spells with some stroke of genius. For example, his disastrous 1970 double album, Self Portrait, quickly gave way to that same year’s beautiful New Morning, or when he emerged from his controversial Christian period with the exquisite, Mark Knopfler-produced Infidels. Or when Oh Mercy followed those really awful albums he did in the mid-80’s. It’s just one of those things that happens in Dylan’s world. Currently, it seems, we are in one of those weird spells – the detour kind. For the last several years, Dylan has been focusing more on his singing than anything else, and released a couple of albums of his interpretations of classic standards, most of which had been popularized by Frank Sinatra. When the first one, 2015’s Shadows In The Night came out, we thought it was cute – well, actually, at first we were terrified, but then we heard it and thought it was a bit adorable. Bob was trying something out and, despite the world’s initial reservations, it wasn’t half bad. Then, in 2016, he released Fallen Angels, which was more of the same. “Sure, Bob, go ahead, get it out of your system”. Like its predecessor, it was pretty decent. I mean, nothing on that album was ever going to elevate him to the stature of those he was trying to emulate, but it was still kind of cool. Surely that would be it, and he would get back to writing awesome songs again soon – in the mid-90’s he took a similar detour, releasing two albums of folk standards before triumphantly returning with Time Out Of Mind, one of his greatest albums ever. But no, he’s still not done. Whether this really is Bob’s trip now, or if he is just trying to stick it to the world, it’s anyone’s guess, but this year he released Triplicate, a TRIPLE album, again of all standards. Packaged as a whole, these are thematically divided into three albums – ‘Til The Sun Goes Down, Devil Dolls, and Comin’ Home Late. The thing is, these records are not terrible. The arrangements follow Dylan’s recent forays into haunting old-time country styles and often sound like the aural equivalent of a David Lynch film. I always appreciate when jazz and country come together and it does come together well on these records. Bob is not in bad voice either. It’s not as smooth as it was, say, in the Nashville Skyline era, and there are times when he does sound a bit like a drunk Muppet, but there are other times when he really kind of nails it, sounding completely unlike anyone else in the world. And he sounds sincere too. There really is nothing about these records that sound like a put-on. He was recently quoted as saying that these sessions were some of the most satisfying he’s ever had. So that’s good. The question I have now, more than any other is, how necessary is all this? Triplicate, to me, comes across as the kind of set that would come out posthumously. The first two, sure, take a detour and do something different. But then to turn around and drop three more albums, all at the same time, it’s kind of overkill. Even his good buddy, the amazing Willie Nelson, who has cut over a dozen albums of standards over his career, has had the good sense to space them out a bit. 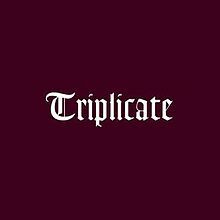 I do want to reiterate that Triplicate is quite good. All of these “American Songbook” albums are quite good. I am not here to belittle the actual music on these discs. I very much enjoy his fragile old voice set against a shadowy pedal steel on songs like “These Foolish Things” and “Sentimental Journey”, or fronting an eerie big band on “The Best Is Yet To Come”. These records are perfect for relaxing on a rainy day, or to have in the background while reading or perhaps at a dinner party. This is one of the most inventive interpretations of this sort of material that has ever seen the light and the world is most definitely a far better place for these recordings being in it. But still, c’mon Bob, get with it. It’s been five years since an original Bob Dylan song has been released, and the world needs him now more than ever. If you count Triplicate as three separate albums, as I do, then this decade has brought forth six Bob Dylan albums, only one of which containing any original material (2012’s excellent, but slightly long-winded Tempest). At the time of this writing, the modern bard turns 75 years old tomorrow. Who knows how much longer he will around, or how much longer he will be at it. The last thing any artist of his caliber needs to do is go out on five albums of interesting-but-not-exactly-amazing Sinatra tributes. That is just too weird, even for Bob. The times have certainly changed and the hard rain is most definitely falling, but the chimes of freedom are no longer flashing and there is no answer blowing in the wind, at least not a clear one right now. So Bob, for the love of mud, pick up your pen, my good man. We need you now, more than ever. « Oh no, not another tie!